The bill to arm Baltimore City school officers appears to have come to an end once again. BALTIMORE — The bill to arm Baltimore City school officers appears to have come to an end once again. Baltimore’s delegates voted 10 - 5 against the proposal on Saturday. It’s a vote which meets the approval of the Maryland ACLU as it tweeted its appreciation for the bill’s defeat. The ACLU also urged lawmakers to focus on funding schools instead. The president of the School Police Union has been a vocal supporter of the bill. Especially, in the wake of a school shooting at Frederick Douglass high school in February which left a staff member injured. Baltimore City Schools is the only school system in the state with its own sworn police force, but officers must keep their weapons locked up during the day. The proposal to allow Baltimore City police officers to carry weapons had been debated for months. 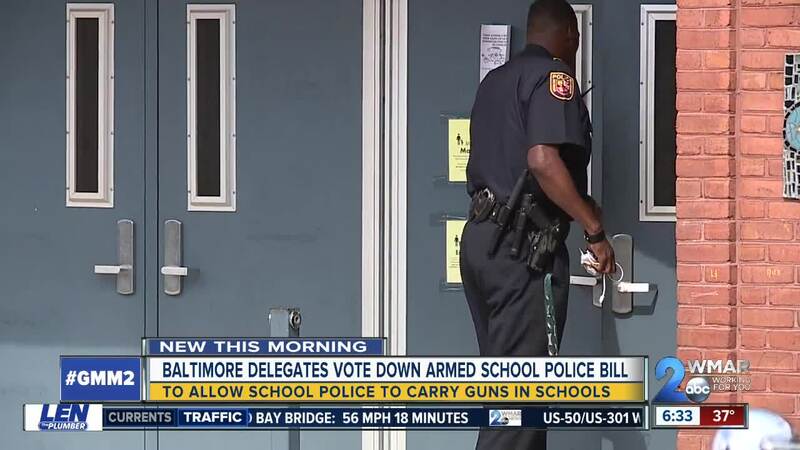 Baltimore delegate Cheryl Glenn, the bill's sponsor withdrew the bill in January after the Baltimore City school board voted against the idea of armed officers in schools. The school board reversed its opinion after the shooting at Douglass. Glenn hasn’t had much success with the bill to arm Baltimore City school officers after it was previously defeated in 2015 as well.